Testimonials appearing on this site may be received via text, audio or video submission. They are individual experiences, reflecting real life experiences of those who have used our products and/or services. However, they are individual and subjective.. We do not claim or make any admission that the testimonials are typical results that consumers will generally achieve. The testimonials are not 100% representative of all of those who will use our products and/or services and we make no admissions of such. 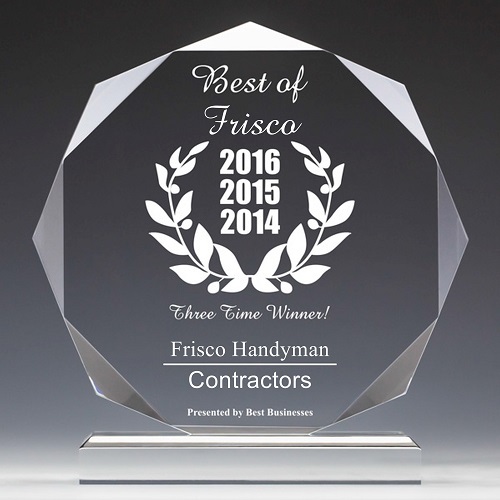 Frisco Handyman is not responsible for any opinions or comments posted to our site. We are not a forum for testimonials but do provide testimonials as a means for our users to share their experiences with one another. All testimonials appear after they have been reviewed by the management of Frisco Handyman. Any testimonial displayed on https://friscohandyman.net is strictly representative of the views of the reviewer. Frisco Handyman will never instruct a person on what to say in a testimonial. Frisco Handyman will disclose any material connections that it has with any person providing a testimonial, so far as it is aware. In the event of a negative testimonial from a customer, Frisco Handyman will have the option of not providing [products/services] to the [customer/client] for future reviews. So far as it is able, Frisco Handyman will monitor product/service reviews made by [customers/clients] to ensure that the claims made are truthful and can be substantiated.